AC Motor Controller (Part 3 of AC Conversion, Interview with Eric Tischer). 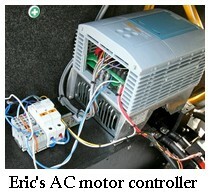 You can find part 1, AC Conversion here, and part 2, his Electric Car Motor here. Lynne: I see you've uploaded a diagram of your VFD's programming environment to your website. So, is this an open source project, then, or am I misreading things? That's such an interesting idea. Eric: I am considering making the project open source, it basically depends on how much time I have away from my job to build my ac motor controllers. The snapshot of the program environment was just to show people how flexible the programming was. 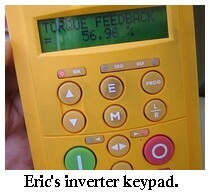 If I sell the inverter, I would want people to still have access to the programming features. 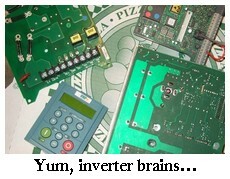 I hope to start selling the inverter soon, I have already begun selling motor adapters, even some for DC conversions. I see. Motor adapters? For the transmission, you mean? A lot of things seem more complicated than they actually are. Is it possible for someone who is relatively non-geek to do what you've done? Could the ac motor controller be broken down into a series of followable steps - don't step off the path, please - that a layperson could duplicate? Building the hardware for the ac motor controller would not be difficult for someone to do, especially if they had instructions and know how to solder. The difficult part is tuning the ac motor controller. My first step was getting the motor to run in a very basic mode, V/Hz mode, which controls speed. The next mode was sensorless vector, which controls speed and torque, and requires current sensors on the motor cables. The controller requires a set of motor parameters to work properly. The best mode is closed loop vector, which uses current feedback and an encoder (to measure slip). I'm currently using sensorless vector, but hope to some day try closed loop vector. Are the components you used for the ac motor controller readily available? Or do you have to know the wizard to get a special chip? Components are available online, I bought my IGBT pack from pwrx.com. I use a water-cooled heat sink to keep the ac motor controller cool. In my head, I'm picturing a reasonable generic setting for the ac motor controller one could start with - and then some fiddling with parameters. Is it that simple, although perhaps time consuming? Are there potholes in this process, expensive things to break? My tuning process was basically monitoring current and finding the correct parameters. Most motors are 60hz 230v 1750 rpm, this is where I started. Let me see if I understand the differences between v/hz mode, sensorless vector mode, and closed loop. V/hz mode, very simple, only controls the rpm. Problem with that is the motor couldn't talk back to the controller, so whatever current was required to keep the motor rpm at the rate requested by the controller was exactly what it got. Driving in this mode is a wild ride. The controller doesn't know what the slip speed is, so it can command huge amounts of acceleration. If the motor does not stay synched, the motor stalls out. The car may be completely stopped, but the controller is still putting out a frequency thinking the motor is still accelerating. In real life, torque varies too at a given RPM. Hills, wind, bumps, all those things could make the motor call more current from the battery pack than the controllers delicate internal bits are prepared to handle - resulting in overheating. If the motor controller doesn't supply enough voltage and current, the motor will stall. Picture kids on a teeter-totter. They have to push at the right time to keep it moving. If their legs are pushing at the wrong frequency, it will not move. Why do you need the encoder? What does slip feedback do for you? Slip feedback is a measurement of torque. 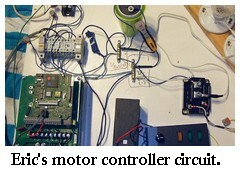 The encoder measures the motor speed, and the controller can then calculate slip. Sensorless vector can only estimate motor speed by the current. Next question: You haven't said much about regenerative braking - the most attractive part of an AC control system in some people's eyes. Is it easy to add this feature with what you've got right now? My controller has regenerative braking. Basically, I just command a negative slip, or command the motor to spin slower than it currently is. The controller puts energy back into the battery when the motor is slowing the car down. Start at part 1 of the interview, AC conversion.